Before the regular football season games begin, I scurried to book activities into my schedule. For starters, after waiting about 30-some years for my parenting responsibilities to decrease, I’ve finally committed to a Motorcycling Basics and Licensure course along with my daughter and her fiancé. It has simply been one of those things, probably since watching James Bond films in my youth that hung on my bucketlist. Another commitment has been to coordinate with my youngest son and his sister for an intermediate sign language course with our local park district. She has had two courses at university level and my son took the introductory course awhile back. I used to know at least the alphabet back in 7th grade when my girlfriend taught it to me so that we could have covert communications while our teacher’s back was turned! Wanting to keep the knowledge intact for my kids, I thought that I could bone up with some flashcards and join them in the advanced level class. You never know, as hearing is fading within some of our household bunch, it may come in handy one day! We also have several MacBooks among us, and we have never taken any formal training. Fortunately, the Apple store offers free workshops in our area, so I’ve scheduled a suite of them over the next couple of weeks just to facilitate my use. I typically use a PC laptop and am entirely familiar with it, but there are certain features available to Mac users that I’d like to explore. Additionally, I have prospects of working with a colleague to coach teachers in the use of iPads, and I determined that I would benefit from picking up more tech skills that I can share. Lastly, there are prospects to venture toward in open courseware. I am ready to make some decisions on what to schedule and in what order. While having some familiarity with several Learning Management Systems (LMS), I would certainly enjoy experiencing from a student’s perspective what notable professors are doing with online learning. In the near term, I’m very excited about a photo shoot scheduled for tomorrow. My cronies have convinced me that I should consolidate my diverse businesses into a branded site. I envision a single portal which branches into each of my sectors that I am known for and for which I have already established some websites. We’ll see how that evolves. This is one for which I would appreciate any constructive feedback, www.geniusschoolonline.com. I’m aware that it still needs some edits. 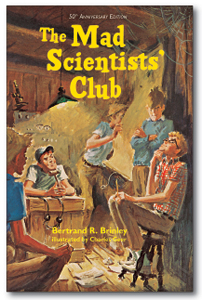 Sheila became my friend about the time I’d read The Mad Scientist Club, and that set my interest in science, skepticism of authority, and problem solving. I found a loyal friend in Sheila who was intelligent, industrious, and kind; while I was a bit of a tomboy, and found humor and novelty to be amenable to my personality–kind of like the boys of the book. Sheila was the voice of reason; I was the voice of “why not?” To this day, when we talk we find that we are still the same, and time and distance have not changed anything in our relationship and feelings are the same. In fact, we cry a bit at the conclusion of our calls. Writing is easier on the heart, and there is always so much to share. Life has its struggles, and I suppose it is somewhat Freudian to be defensively impersonal while we course through each day mindful of how things are with each other. Work is cathartic and aspirations are running high for the means to be free and able to play like kids once more.